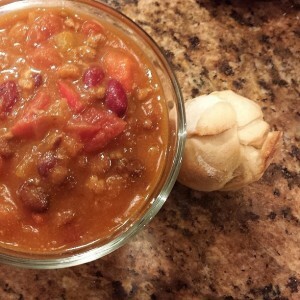 This time of year, I’m all about soups and stews and that’s why I flipped over this pumpkin chili recipe. The hubster and I are full-on into our “SuperClean 2014” decluttering and paring down project, and it’s going really well. In the first quarter, we decided we wanted to clear out our pantry, so we’ve made a game out of it. The big rule is that the hubster and I have agreed not to buy anything that might go in the pantry or freezer- no new pasta or rice, nothing in a can or jar or any kind of package, and no new meat. We can buy dairy and produce. That’s it. So everything we make has to come from the produce and dairy I get to buy, plus whatever’s already in the freezer and pantry. I was a little apprehensive about this pumpkin chili recipe, because really, pumpkin in chili? Sacrilege! But I had like six cans of organic canned pumpkin in my pantry, plus I froze a bunch of pureed pumpkin in October when all the pumpkins were at their peak and super-yummy. So I really needed a pumpkin recipe. What’s fascinating (to me) is that you can hardly even taste the pumpkin. Rather, it adds a wonderful little creaminess to the chili that adds to the heartiness of the dish. I made a few sacaduros from Rose Levy Beranbaum’s The Bread Bible to accompany the chili. These little dinner rolls are easy and fast to make and super yummy. Top this chili with a little bit of cheddar, and you’ve got quite a comfort food meal. Add ground beef, salt, and pepper to a large pot. Brown meat and soak up grease with a paper towel or drain beef. Add onion, green pepper, and garlic, and cook until translucent. Add pumpkin puree, tomatoes, beans, water/broth/bouillon cubes, cumin, chili powder, oregano, bay leaf. Stir well and bring soup to a boil. Then, reduce to a simmer for at least an hour, stirring every 10-15 minutes. Serve with a bit of shredded cheddar cheese and chopped scallions.